Project planners behind the East River Coastal Resiliency Project held another community forum this week to discuss the upcoming redesign of East River Park for storm surge protection and the possible upgrade of pedestrian crossings at 10th, 6th, Houston, and Delancey Streets. 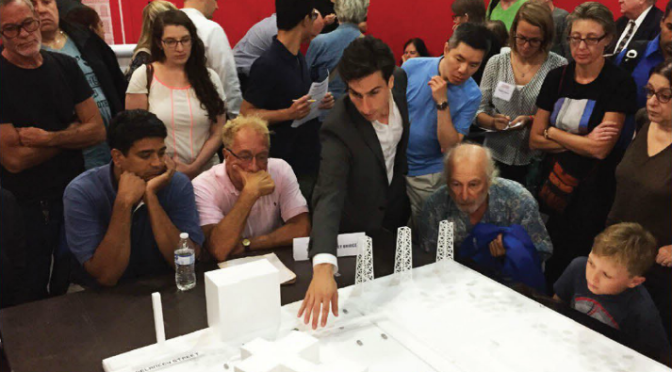 The presentation was more extensive than given previously, and new details emerged about those bridge designs. You can view the entire presentation below. You can see the progression from strict flood protection, to park enhancement, to neighborhood enhancement reflected in these drawings. 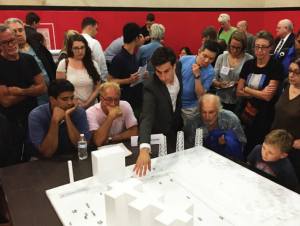 Project planners want to connect our neighborhood to the park in a meaningful, interactive way, and pushing pedestrians only up Delancey Street does not meet their overall goals. That’s why they are still pushing for an option that creates easier access to and from Grand Street, where three city bus lines terminate. They are also working within several constraints that are not easily shown on these drawings. First is that the park area directly under the Williamsburg Bridge is a Homeland Security zone that cannot be interfered with. A flood wall will be built under the bridge, but the berm needs to rise a certain distance from the concrete wall that’s recently been erected. The second, more imposing obstacle is that the East River board is unwilling to move the entrance to our parking lot on Delancey Street, so any ramp from the pedestrian bridge needs to end right before that driveway, exactly where it does now. The current ramp, however, is too steep for safe wheelchair access and needs to be lengthened to create an acceptable grade — the only way to lengthen that ramp while making it terminate at the same spot is to loop the ramp around to a pedestrian bridge farther away. That’s why the designers have set the pedestrian bridge a little farther south. Once you do that, adding a short staircase toward Grand Street naturally lands just in front of building 4. Board president Gary Altman has already pushed through a board resolution opposing that staircase, and board member Ellen Gentilviso was again at this week’s community meeting pushing the project planners to scale back their design to include access only from Delancey. What’s unfortunate is that the current board, led by Altman and Gentilviso, are blocking a more creative approach to this design problem. For one thing, refusing to move our parking lot entrance forces the pedestrian bridge south and makes any staircase on the FDR access road intrude more on to coop property. But there’s another opportunity here that a board open to positive change might embrace: that Delancey Street parking area is inefficiently lotted for cars and has room to spare. Re-configuring the parking spaces could create new spaces for new revenue, and make room for a less imposing pedestrian bridge. If we worked with the ESCRP designers as true community partners, all sorts of interesting possibilities could arise.